The purpose of the test: In 1993, Levine et al developed The Brigham and Women’s Hospital Symptom Severity Scale (SSS) and Functional Status Scale (FSS) to measure symptom severity and functional status in patients with carpal tunnel syndrome (CTS). Constructs or items the test was designed to measure: The SSS and FSS are self-administered questionnaires that were designed to measure symptom severity and functional status in patients with CTS. The SSS consist of 11 questions based on six domains thought to be critical by experts for evaluating CTS: pain, paresthesia, numbness, weakness, nocturnal symptoms, and over all functional status. The FSS contains 8 functional activities that are commonly affected by CTS and that are performed by a wide variety of patients. Levine et al stated “there is no universally accepted measurement of the severity of symptoms or functional status of the hand.” Therefore, they examined validity by assessing traditional objective measures of disability and impairment found in patients with CTS: grip, pinch strength, median nerve sensory conduction, 2 pt discrimination, and Semmes Weinstein monofilament testing. However, as expected they found mod-weak correlations because the SSS and FSS measure disability not usually captured by objective findings. Since objective findings in patients with CTS often do not correlate with symptom and functional improvements, these researchers also analyzed validity by looking at patient satisfaction. Greater satisfaction with results correlated with greater improvement in the SSS and FSS scores. Amadio et al evaluated patients pre op and post op CTR and measured the following objective findings: sensation, grip strength, pinch strength, dexterity, and motion. Their results found the only objective finding improved after a CTR was dexterity. No other physical measurement improved despite significant improvements on the SSS and FSS. These findings support claims made by Levine et al that establishing validity of the SSS and FSS cannot be solely based on objective findings since improvements in symptoms and function do not always correlate with a change in objective findings. The MCID is the smallest amount of change between two outcome measure scores that has clinical meaning to a patient. Ozyurekoglu et al determined the MCID of the SSS by using a ROC curve and analyzing the relationship between change scores on the SSS and the clinical result of a carpal tunnel injection. The clinical result of each injection was judged as satisfactory if the patient was satisfied with their results and did not require any additional care. The MCID of the SSS was determined to be 1.04 in this study. For practical purposes, the researchers suggest using 1.0 as the MCID. The MCID of the FSS has not been determined. The SSS and FSS scales can be used to monitor symptom severity and functional status in patients with CTS. Studies have shown that the objective findings in patients with CTS do not always correlate with improvements in symptoms and function, therefore the SSS and FSS can be very valuable tools for assessing a patient’s responsiveness to carpal tunnel interventions. Currently, there is no research that has been conducted on the MCD but the MCID has been found to be 1.0.4 The SSS and FSS have been found to be reliable and valid in patients with CTS treated non-operatively and post-operatively. 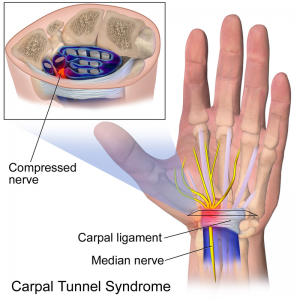 The SSS and FSS have also been included as part of a clinical prediction rule for diagnosis of carpal tunnel syndrome. ↑ 2.0 2.1 2.2 2.3 2.4 Amadio PC, Silverstein MD, Ilstrup DM, Schleck BS, Jensen LM. Outcome Assessment for Carpal Tunnel Surgery: The Relative Responsiveness of Generic, Arthritis-Specific, Disease-Specific, and Physical Examination Measures. JHand Surg (Am). 1996; 21A: 338-346. ↑ 4.0 4.1 4.2 Ozyurekoglu T, McCabe S, Goldsmith LJ, LaJoie AS. The Minimally Clinically Important Difference of the Carpal Tunnel Syndrome Symptom Severity Scale. J Hand Surg (Am). 2006; 31(5): 733-738.